Hopes for a fresh start on immigration slammed into political reality Tuesday as the Senate's top Democrat said he had rescinded an offer to President Trump on a border wall and the White House called an emerging bipartisan compromise "dead on arrival." Senate Minority Leader Charles E. Schumer (D-N.Y.) said he had withdrawn an offer to Trump of $25 billion for new border security measures in exchange for permanent legal protections for some undocumented immigrants brought to the country as children. "We're going to have to start on a new basis, and the wall offer's off the table," Schumer told reporters. He said his proposal had applied only to a deal that was never realized. News of his decision came as Schumer is facing a backlash from liberals that he had been too accommodating to the president. Late Tuesday night, Trump reiterated that "if there is no Wall, there is no DACA." In a message on Twitter, the president said: "Cryin' Chuck Schumer fully understands, especially after his humiliating defeat, that if there is no Wall, there is no DACA. We must have safety and security, together with a strong Military, for our great people!" Trump repeatedly promised during the 2016 campaign that he would build a border wall that Mexico would finance. Democrats and some Republicans have balked at the administration's request of $18 billion to pay for it. Schumer made the proposal in a major concession to Trump on Friday in a private meeting at the White House, then pulled it back Sunday night, according to a person familiar with the meeting. Schumer acknowledged Tuesday that the offer was no longer operable. At the White House, the administration said Tuesday that it expects Congress to move beyond a bipartisan deal to protect the undocumented immigrants that the president rejected during a vulgar exchange with lawmakers nearly two weeks ago. "It's totally unacceptable to the president and should be declared dead on arrival," press secretary Sarah Huckabee Sanders said during a White House news briefing of a plan being crafted by Sens. Lindsey O. Graham (R-S.C.) and Richard J. Durbin (D-Ill.). She said their plan, not yet written into formal legislation, would not sufficiently secure the border and would increase legal family-based immigration, a practice that conservatives are hoping to curb to dissuade migrants from entering the country. The partisan sniping came only a day after lawmakers struck a bipartisan deal to end the three-day government shutdown with the promise to move forward on immigration. The disputes underscored the difficulty all sides face in trying to compromise on the issue while answering to party political bases that are far apart on immigration. 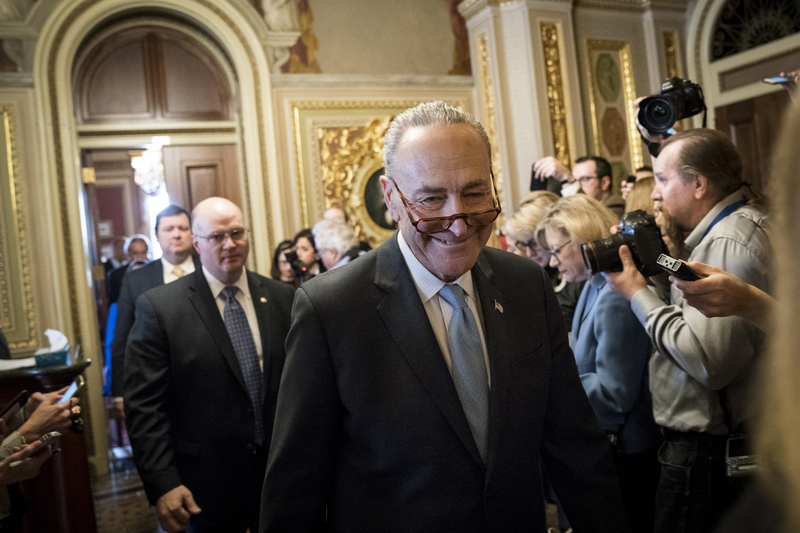 Schumer's decision to withdraw the border wall offer drew rebukes from Republicans, who accused him and Democrats of not taking ongoing talks seriously. And the move once again exposed divisions among Democratic lawmakers, who support permanent legal protections for the undocumented immigrants but cannot agree on how to compromise with Republicans on a deal. Sen. John Cornyn (R-Tex. ), who will play a central role in the next round of immigration talks, called Schumer's decision "a step backward." Asked whether funding for a border wall should be on the table in the immigration talks, Sen. Cory Booker (D-N.J.) said no. But the potential 2020 presidential candidate said he "trusts Schumer a lot" as the talks continue. Sen. Heidi Heitkamp (D-N.D.), a moderate facing reelection this year in a state Trump won resoundingly, was more open to the idea, albeit under a different label. "You know, I don't call it 'border wall.' I think it's important we call it 'border security,' " she said. Schumer's decision to engage Trump on border wall funding even exposed fissures in the ranks of the Congressional Hispanic Caucus, a key bloc that has pushed fellow Democrats most aggressively to secure permanent legal status for immigrants protected by the Deferred Action for Childhood Arrivals program, which is set to expire March 5. Rep. Luis V. Gutiérrez (D-Ill.), a senior caucus member, said he would reluctantly accept such an arrangement if it meant protecting "dreamers," as DACA enrollees are widely known. "Anything you put up, you can take it down. But you can't bring back kids that have been deported," he said. But Rep. Michelle Lujan ­Grisham (D-N.M.), who chairs the caucus, said the group's opposition to new border wall construction "has not changed, irrespective if some, in their passion to protect dreamers, have shown a willingness to build Trump's campaign border wall." During the Friday meeting, Trump and Schumer agreed that most of the $25 billion would be appropriated at the start, with more doled out in the future, according to a person familiar with the meeting who spoke on the condition of anonymity to talk frankly about the exchange. Aides to Schumer would not comment on the exact price tag. Over the weekend, Schumer described the meeting several times in public remarks, saying that Trump "picked a number for the wall, and I accepted it." At other points Schumer said he "reluctantly" agreed to discuss constructing a wall — but never revealed the sum. But Office of Management and Budget Director Mick Mulvaney said: "Once Schumer started talking about the president backing away from the deal that never existed, he said he offered the president everything on the wall and the military. That just wasn't true. . . . The president knew Schumer was mistreating him." Matt House, a spokesman for Schumer, said Mulvaney "once again isn't telling the truth. Senator Schumer offered the president everything he asked for on the border and more than he asked for on defense." Even if Trump pressed for tens of billions of dollars in border wall funds, senior members of his administration have told lawmakers that they believe such construction is unnecessary. White House Chief of Staff John F. Kelly told members of the Congressional Hispanic Caucus last week that "a concrete wall from sea to shining sea" would not be built, according to attendees. Later, he said that instead of a wall along the entire span, "we need 700 more miles of barrier." Negotiators face a Feb. 8 deadline, leaving less than three weeks to sort out some of the most emotionally charged issues. Some moderate Republicans involved in the talks expressed optimism that a deal could be reached. "I think the Democrats are willing to do quite a bit on border security," said Sen. Jeff Flake (R-Ariz.), adding later: "They've been willing to put a lot on the table." Flake predicted there will be 20 Republican senators who will not agree to a bipartisan immigration deal but that "I think there are 30 Republicans who could go for a path to citizenship and do something broad." Josh Dawsey and Mike DeBonis contributed to this report. Ed O’Keefe covered Congress and national politics for The Washington Post from 2008 to 2018. He has also covered federal agencies and federal employees in the Washington area, the war in Iraq, and the 2016 presidential campaigns of Jeb Bush and Marco Rubio. Sean Sullivan has covered national politics for The Washington Post since 2012. He previously was the editor of Hotline On Call, National Journal Hotline’s politics blog, and has also worked for NHK Japan Public Broadcasting and ABC News.